Much of our knowledge of the first three centuries of Christianity comes from the writings of Eusebius (c. 260-340), and much of our knowledge of the early centuries of Christianity in Britain comes from the Venerable Bede's Ecclesiastical History. These two texts are combined, with other historical works, in this manuscript written at Finchale (near Durham) about 550 years after Bede's death. 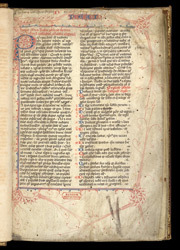 The first page of the text contains a preface and the start of a list of the chapters. In the top margin is a partially erased added inscription of Durham cathedral. The script and decoration are typically English, although the scribe was apparently a foreigner.